Information on one of Namibia's National parks - Namib-Naukluft. Namib Naukluft Park is the largest game park in Africa (40 000 sq. km) and fourth largest in the world. There are four sections in the park: Sossusvlei and Sesriem, Naukluft, Namib section and Sandwich Harbour. Naukluft. Facilities: camping sites with communal ablution facilities. Camping sites are located near Naukluft River. History. Naukluft Mountain Zebra park was established in 1964 with the accrual of farm Naukluft as a sanctuary for Hartmann's zebra. Most of the farm surrounding Naukluft mountain massif were purchased by 1970. In 1979 the area known as Diamond Area 2 (south of Kuiseb river, including Sesriem and Sossusvlei) was added to form Namib Naukluft Park. Vegetation. The vegetation of the Naukluft complex has been classified as semi-desert savanna. There are several interesting species occurring in the area. Aloe sladeniana, Aloe karasbergensis, cluster fig, Commiphora, Acacia (thorn) and Euphorbia. Wildlife. The following mammals are likely to be seen: steenbok, springbok, oryx, kudu, mountain zebra, dassie rat, chacma baboon, rock dassie, klipspringer. Up to 200 bird species have been recorded in the area. Sesriem and Sossusvlei. Entrance for the visitors is between sunrise and sunset only. 18 camping sites are available at Sesriem with communal ablution facilities. Distance between Sesriem and Sossusvlei is 65 kilometres. Last 5 kilometres before Sossusvlei can be negotiated with 4x4 vehicle only. 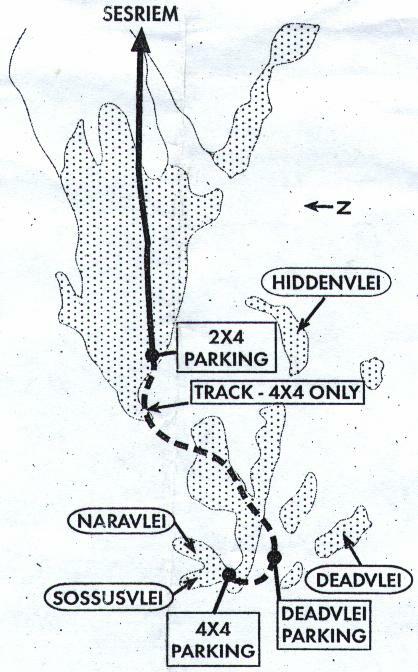 There are several local companies providing shuttle services from 2x4 parking area to Sossusvlei (fee is on request). Sesriem Canyon is located only 4 kilometres from Sesriem. The canyon, approximately 2 to 4 million years old, is up to 40 metres deep and about 3 kilometres long. Sossusvlei is one the places definitely worth to see in Namibia. Huge red sand dunes, camel thorn trees and vlei (shallow water pond) itself, filled occasionally after a good rains are the attractions of the area. Remember: visit dunes as early as possible (temperatures are not that high yet and you can take the best pictures), always carry a water with you, sun block cream is a must, as well as a hat. Petrified dunes is a feature of the Namib-Naukluft Park. Name. The name of Sesriem is derived from the fact that to reach water six ox thongs were used in old times. Namib. Camping sites are at: Mirabib, Kuiseb river bridge, Homeb, Kriess-se-Rus, Bloedkoppie, Vogelfederberg, Tinkas and Ganab. Visitors must provide own equipment, water, food and fire wood. Sandwich Harbour. No camping allowed. Open to day visitors between sunrise and sunset. Only 4x4 vehicles are allowed. Entry permits are available in Swakopmund. No angling allowed between 25 January and 15 April. Visitors must provide own equipment, food, water and fire wood. No permits are required when driving on the public roads. Permits can be obtained in the Central Reservations office (Windhoek), Hardap, Sesriem, Luderitz, Swakopmund Resorts office. Location: about 10 km south-west of Büllsport, on the road D854. Through the gates, follow a road northwest into the Naukluft for about 12 km before the NWR's rest camp. Additional information: Day visitors are admitted between sunrise and sunset only. 18 camping sites are available at Sesriem. No camping is allowed at Sossusvlei. The distance between Sesriem and Sossusvlei is 65 km. Camping facilities and water are available at stop-over points. Groups must be minimum of 3 and maximum of 12 participants. Own food and camping equipment must be provided. The price: 12 people for 8 or 4 days: on request. Medical questionnaire is here. Please print it out and fill it in. All hikes are subject to a medical report on each of the hikers being submitted to the nature conservator at the Naukluft Park Office. The necessary forms will be supplied upon reservation. Hikes are undertaken at your own risk. Namibia Wildlife Resorts and the Government of Namibia accept no responsibility for injuries or accidents. Groups must consist of a minimum of three (3) and a maximum of twelve (12) people. The 8-day trail covers 120km in a circular route with the first four days being the least strenuous. The 4-day trail covers approximately 58km starting at the main campsite and ending at the Tsams Ost shelter. Hikers wishing to exit at this point must make their own transport arrangements. Vehicles can be left at the starting point as well as at the Tsams Ost shelter where the 4-day trail ends. 8-Day hikers may also leave a vehicle with additional supplies for the last four days at Tsams Ost shelter. Generally these vehicles are quite safe, but you leave them there at your own risk. You may not, under any circumstances, start the hike at Tsams Ost. The going is dry and hot. You must carry a waterbottle (preferably 2litres) and use water sparingly. Fires are not permitted, so you will need a camping stove. Underfoot is hard, steep in places and rocky. Need we say that you want to use only the best in hiking boots. Overnight temperatures may drop to freezing. Warm clothing is essential. Snakes and scorpions do occur in the area, and you are advised to be on your guard at all times. Apply the old hiker's law of "TAKE ONLY PHOTOGRAPHS, AND LEAVE ONLY FOOTPRINTS ". Smokers are required to carry their cigarette butts out with them, and all refuse is to be carried to the nearest refuse bins at the following points:- Ubusis-, Tsams Ost-, Die Valle- and Tufa-shelters, as well as the main camp. The overnight shelters offer water, toilets and the use of a stone hut. Day 1 - Starting at the main Campsite, an easy 14km hike with only two fairly steep ascents. You are rewarded with magnificent views of the valley some 300m below. A shower awaits you at the overnight shelter at Putte, after a relatively easy six-hour hike. Day 2 - 15 km of mainly undulating ground. You descend into Ubusis kloof where chains have been anchored in the rock where negotiation would otherwise be difficult. At the end of a six-hour hike, you may be surprised by the Ubusis shelter, which used to be a holiday cottage. Day 3 - After backtracking to 'Bergpos', the day's hike is a comfortable 12km across the plateau. The chances of spotting Kudu and Zebra are very good. Four to six hours hiking brings you to the Adlerhorst shelter. Day 5 - 17 km which should take six to seven hours take you up an initial steep ascent up 'Broekskeur' after which the trail meanders through patches of euphorbias and quiver-trees. Water bottles can be replenished at 'Fonteinpomp', which is about one third of the way to Die Valle shelter. Day 6 - Climbing steeply, the trail brings you to the top of the 'Die Valle' waterfall which is some 200m high. Although normally dry, it is still a magnificent sight. A total of 16km in about six hours' hiking gets you to the Tufa shelter for the night. Day 7 - A steep ascent up a well-vegetated kloof presents another waterfall which is scaled with the help of chains. Today you reach 'Bakenkop', the highest point on the trail from where you look down at the Tsondap river valley 600m below. A five hour hike over 14km brings you to the Kapokvlakte shelter. Day 8 - The final 16km should take about five hours hiking, culminating in crystal clear pools about 40 minutes away from the end. No doubt you will enjoy a swim at this stage. This also forms part of the day trail, and returns you to the campsite where you started. Note - Days 7 and 8 can be combined. This should only be attempted by extremely fit hikers. One of the most challenging and difficult 4x4 trails in the country. Duration: at least two days (73 km). Own food, camping equipment, spare tyres and parts, firewood and transport must be arranged. See our car rental page for more details. There is a camping site available with a toilets. Group size: maximum four vehicles and 16 people. The price: - per vehicle. Minimum is 4 vehicles. Self-guided trail through the ''Moon Landscape'' to the Welwitschia Mirabilis. A permit is required. Only open to day visitors between sunrise and sunset. No camping is allowed. Only 4x4 vehicles. No angling between 25 January and 15 April. See our car rental page for more details. Can you please mention on the web page that there is a shower with a paraffin geyser at the Tjeriktik camp site (on the Naukluft Mountain). Visitors must just bring say 500ml of paraffin for a nice hot shower. We missed out on this luxury as we didn't have any paraffin with us.